In Tropico 6 you can send your agents on raids to foreign lands to steal world wonders and monuments to add them to your collection. Below is a World Wonders guide with that lists each of the landmarks along with where to find them and their special function which you will be granted once you have constructed them. 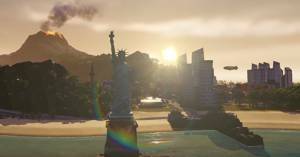 There are 17 World Wonders in total in Tropico 6. This World Wonder makes trees grow around it, reducing the pollution in the area. It also increases tourism and delivers entertainment. After placing it no citizen will die due to a lack of proper healthcare. Everyone who visit this World Wonder receive a high school education. Everyone who visits this World Wonder will avoid extreme political views. Every visitor will donate money to the nation's treasury. Increases movement speed of boats. All buildings become more resistant to attacks. Each immigrant has 100% happiness. This famous landmark increases tourism ratings and delivers entertainment. Happiness of visitors is related only to the quality of food and to entertainment. People who visited this wonder with a great lack of one of the happiness parameters receive a similar boost to another happiness parameter. The famous landmark increases the time tourists spend on the island and increase tourism fees. This World Wonder increases effectiveness of Plantation and Hydroponic Plantation. It also increases tourism ratings. During combat the rebels attack Winter Palace instead of El Presidente's palace. This World Wonder also increases tourism. All edict costs and costs of their upkeep are halved when you construct this World Wonder. Check out our Raids Guide page to find out more about the Raid Buildings. No discussions open for Tropico 6 at the moment.